Executive Summary: As the fiscal year draws to a close, I submit this report to the board outlining the activities of the President and an update on actions, initiatives, needs and goals for the coming year. Strengths: In short, the strength of FOTA continues to come forth from the active participation of select members volunteering, serving, and developing as leaders through our various committees and officer roles. It comes from the fresh ideas and perspectives brought to us in our interactions. Strength also comes in the form of the long-term commitment of our seasoned board members to make FOTA successful. Through experience and hard work toward, our board strives to improve the quality of our membership experience, mentor new volunteers, and advocate for OT practice in our state. Strength continues to amass by building a community of practitioners –locally, virtually, and through special interests. We celebrate our organization each year by holding a top-notch annual conference with useful clinical information with lucrative networking and exhibition opportunities. Challenges: The challenges for FOTA are to build a much larger and diverse community of practitioners and to articulate the value of membership in our community, thereby increasing our power to support practice, educate, and advocate. The challenge is to motivate and inspire OTs to be members, and then to serve, and then to lead. FOTA must develop a better “case in support of membership” which includes expanding the tangible benefits and incentives to become a FOTA member especially as practicing clinician post-graduation. The professional community needs more information about the threats to our practice, issues of policy and reimbursement, and resources to act in support of our practice. People want an effective means to improve their own practice, and bring more meaning to their work. Our challenge is to spread the message about FOTA and connect with all Florida OTs – then deliver on promises. And here’s my part of what happened toward that effort since our last meeting and some important goals to pursue moving forward into next year. Presided over the FOTA Leadership Development Program including the recruitment of 5 new members of the committee, coordinating monthly conference call meetings with the committee, oversaw the planning and implementation of a second Leadership Development event on May 12th, 2018 with nomination and registration of 18 participants from OT, OTA, and student ranks. Appointed Nayda Ramos, COTA/L Co-Chair of the program. Attended FOTA Conference meetings with students, Regional Reps, and with our meeting of the SIS Chairs on the Practice Committee. Provided Regional Reps with the remaining hard copy promotional flyers and some FOTA shirts and tote bags to be used in local events and promotions in their regions. Met with our Lobby Firm representatives and participated in a short course session on Legislative issues at conference – has presented by Governmental Affairs and Lobbyists. Participated with the Governmental Affairs (G.A.) Committee in Hill Day, January 10th including the office meet with several Florida Legislators and meeting with clinicians, faculty and OT/OTA students from the Tallahassee area. Delivered talking points on the distinct value of OT for Floridians including in the practice areas of Telehealth, Chronic Pain and Substance Abuse areas. Assisted the Governmental Affairs Co-Chairs in connecting with subject area experts related to areas of clinical practice for advisement and/or testimony to legislative committees during the Florida legislative session. Collaborated with G.A. committee and our lobbying firm Corcoran & Johnston. Posted relevant updates to our website and newsletter and to our Facebook Page and to the FOTA Legislative Interest Group throughout session on the progression of relevant legislation. Participated in a Conference Call with Medicaid Officials with a Q & A session on CPT billing and received advisement on how to better advocate for OT and Medicaid Clients in Florida through increasing the use of online or telephone complaints resources and practitioner surveys. Collaborated with state association for Speech Therapy (FLASHA) in an advocacy drive regarding Medicaid Policy on coverage via managed care companies including engaging members to sign a petition against the policy of inadequate coverage in accordance with national standards of care. Engaged the Board Executive and Membership Committee in a discussion of proposals for the promotion, incentives, and marketing to raise clinician membership in FOTA and retention of student members as they transition into practice post-graduation. Ideas included renewal and new member discount at certain intervals, and the provision of free continuing education courses in person at local events, or online – planning and implementation area still ongoing. Request the frequency of membership promotion e-mails and messaging be increased to build membership. Appointed an Ad Hoc Committee for development of a hard copy tri-fold Brochure to promote Membership in FOTA. Delivered a timeline and delegated Nominations committee to conduct FOTA Elections in March of 2018 resulting in several nominations and the election of President-elect and Re-election of our Secretary. Appointed an Ad Hoc Committee on Schools and Mental Health for FL OT practice --Chair Anjali Parti, OTD, OTR/L in response to the Parkland, FL., school shootings both for preventative and disaster response aspects of practice for Florida OTs. The development of resources, and a position paper with implications for legislative advocacy are ongoing. Attended several conference calls in the development of this project. It is proposed to do a survey for a needs assessment of practitioners on this subject to inform the nature deliverables in the long-term for this project. Attended the AOTA Conference in Salt Lake City, Utah, and the Pre-Conference Meeting of ASAP (State Presidents) including a session with the AOTA Representative Assembly –Edwin Myer, OTD, OTR/L RA FL. Represented Florida in the march of Presidents at the Opening Ceremony and during the roll call of states during the AOTA Annual Business meeting. Attended numerous AOTA conference course sessions on State and National Policy and Advocacy. Remained in contact and in collaboration with the AOTA RA for FL since his appointment in October of 2017 including his appearance at our conference Town Hall session. 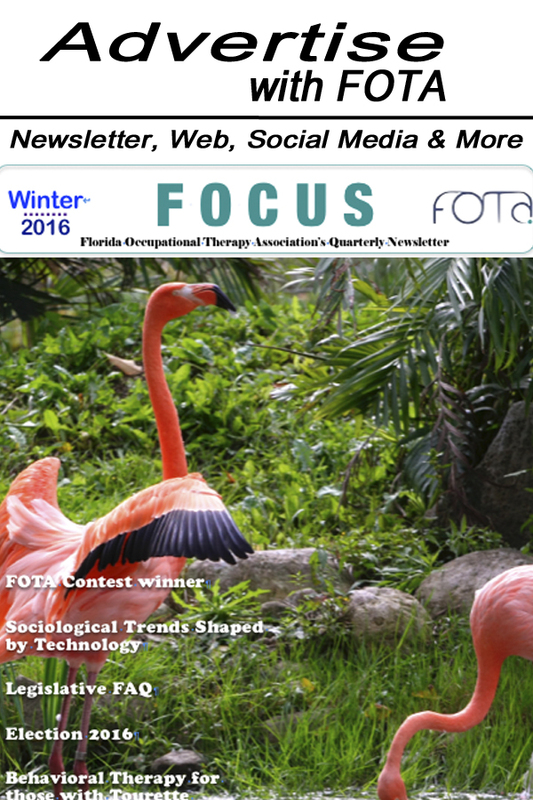 Promoted AOTA events, updates and initiatives on our FOTA Facebook page. Collaborated with our BPPC Chair, David Pallister with guidance on a process to review our Bylaws, and Job Description or Standard Operating Procedures –a priority list of those most in need of review and updating. Assisted in establishing a timeline and process for collecting feedback, changes, and engagement with the relevant parties leading to June 16th voting on several documents. Met and communicated with our Administrative Assistant (AA)on all operational issues from website and database, financial transactions, members concerns, conference, newsletter, and marketing/advertising issues. Conducted a Performance Evaluation of the AA and discussed progress and growth, explored compensation rates for the AA with the FOTA Treasurer in the budgeting process. Discussed the need to revamp the AA Job Description and role delineations. Published articles and updates to the Presidential Blog, to the FOTA Facebook Page, to the FOCUS Newsletter, and to the leadership via Leadership Bulletin e-mails. Campus Outreach with video conference presentations at Keiser University OTA program x 3 graduations, Nova Southeastern University Ft. Lauderdale –Leadership Issues Class Presentation, State College of Florida, Bradenton OTA program FOTA Presentation, Nova Southeastern University, Tampa, White Coat Pinning Ceremony and Orientation session appearances. Responded to relevant “Contact Us” questions from the website form regarding advocacy, practice, membership, and professional issues. Conducted Monthly Executive Board Conference Calls –Treasurer, VP, Secretary, AA and including reports as needed from conference, governmental affairs, and membership committees. Initiated the President-elect orientation process via an initial welcome call and overview of FOTA with supplemental guiding documents including provision of FOTA’s current Strategic Plan, Bylaws, 2017-18 Budget, organizational chart, and meeting minutes for gaining familiarity with organization procedures. If you have established goals on a prior report, describe the progress towards meeting these goals. What are the goals you hope to accomplish by the next board meeting? 4. What are the things that need to occur so that you and/or your committee can achieve these goals? 5. Identify any action / proposal / motion you would like presented at board meeting.